On cue, just as the conference in Vienna ‘Im Anschluss’ begins, (see the article on the conference elsewhere on this page), a review of ‘Forbidden Music’ appears in a German publication that highlights many of the points I shall be making. Yet it also highlights the fact that the children of perpetrators and the children of victims must also pass on before a true representation of history can start to emerge. As I have written in my article on ‘Im Anschluss’, the view of the past as seen through the eyes of Germans born from 1945-1965, is very different from the view perceived by the children of those who were forced to leave. Though both will be subjectively tainted, I feel that Germans and Austrians of this generation have created a fog of misrepresentation in an attempt to distance themselves from the incomprehensible anti-Semitism of their parents’ generation. For Germans reading ‘Forbidden Music’, the word ‘Jew’ is still offensive and under no circumstances to be used. It is even more impermissible when used in describing composers (or indeed anyone) who through choice, conversion or religious scepticism, did not see themselves as Jews. This belief that the word ‘Jew’ needs to be avoided when speaking of Europe’s Cultural Holocaust has resulted in a wilful misrepresentation of events that continues today in both Germany and Austria. I clearly do not hold the views of Daniel Goldhagen, that all Germans and Austrians of the Hitler generation were anti-Semites. Nor do I agree with Steven Beller’s view that Jews were the sole engine of fin de siècle creativity. But there is a tendency for the baby-boom generation of German and Austrian scholars to go too far the other way. By effectively banning the word ‘Jew’ in all discussions because ‘it was the language of persecution’, they effectively close down the examination of events altogether. It is this view that has led to what I see as an anti-anti-Semitism that double flips and results in many works and composers not being evaluated in any objective light. Put very simply, National Socialism drove out the greatest conveyors of German culture. Most who were forced to leave were adherents of a progressive, ever-developing continuity of German culture. When they arrived in safe-havens, they had no option but to assume the mantle of past traditions and re-invent themselves as high-priests of a Germanic golden age of music. Musicians, who only a few years before in Berlin and Vienna had promoted Kurt Weill or Schoenberg, found themselves in their new homelands fêted as the authoritative representatives of a German tradition that had come to a halt after the death of Brahms and Mahler. This had the effect of presenting a picture to post-war Germans that the III Reich had driven out their most progressive musicians. In various countries of refuge, on the other hand, one was presented with an impression that the Nazis had driven out the most stalwart representatives of 19th Century Austro-German Classicism. The conclusion that Hitler had driven out all progressive elements was thus seen as a socio-political act of vandalism. The conclusion drawn from abroad that Germany had thrown out the greatest representatives of their own culture was understood to be the result of mindless anti-Semitism. 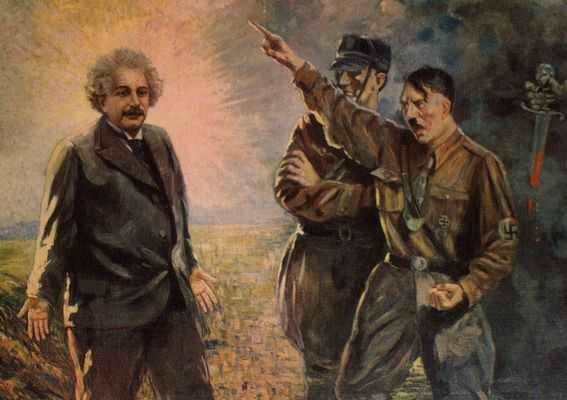 As Alfred Einstein (Albert’s cousin) wrote to Hans Gál, (and quoted in ‘Forbidden Music’), ‘The IV Reich was eager to embrace everything that was branded ‘Cultural Bolshevism’ by the III Reich in order to deflect any suspicions that might arise from their sudden change of heart’ (quoted from memory, so not exact). And it is not surprising that to the next generation, ‘picking up the pieces’ meant building on the progressive ideas that had been lost. In their attempts to distance themselves from the mindless anti-Semitism of previous generations, they purged their language of all Nazi terminology. Justifiably, this generation of restitution scholars and musicians questioned Decca’s use of ‘Entartet’ (‘degenerate’) as a marketing hook – but wrongly, they also removed all references of Jews and Judaism where they saw it as part of the language of persecution. And it is this fascinating historic ‘kink’ that history has yet fully to straighten out. I offer an example: When Egon Wellesz (a convert to Catholicism), landed in England through the sheer good luck of being in Holland on the day of Austria’s annexation, he subsequently wrote to his wife (also a convert), that she should sell their home in Vienna for whatever sum was offered and join him as soon as possible in Oxford where he had managed to secure a teaching position at Lincoln College. After the war, this letter was used to disprove his claim that Jewish persecution had forced the sale. Indeed, Wellesz and his wife had tied themselves in such knots presenting themselves as political refugees that when they tried to make claims that they were persecuted for being Jewish-born, these were dismissed by post war Austrian authorities. Gestapo documents seizing their assets and appending the monikers of ‘Sara’ and ‘Israel’ did not stack up against the Welleszs’ own protestations that they were not Jewish. Indeed, it could have been argued that Wellesz down-played his Jewishness as British authorities were more receptive to political rather than ‘racial’ refugees. In any event, with their continuous denials that they were not Jewish, post-war attempts to prove themselves victims of Nazi anti-Semitism simply back-fired. This is hardly justice, but it is in fact representative of the unintended consequences of restricting the designation of ‘Jew’ to only those who practiced this particular religion. As in the case of Egon Wellesz and his wife, it leaves unanswered the question of whether they should thus be treated as victims of anti-Semitism if they did not consider themselves to be Jews. Fascinatingly enough, Wellesz’s grandson, now an Anglican priest, told me that his grandfather would probably turn in his grave if he had known that the largest exhibition of his life and work had taken place in Vienna’s Jewish museum. I don’t claim Egon Wellesz as a Jew, but I claim him (and most of the other composers in my book) as victims of Jewish persecution. This difference cannot be made unless one resorts to the language that was used by the perpetrators. Not to do so, or to confuse matters by using inverted commas around the word ‘Jew’ when dealing with composers who did not see themselves as Jews would have been needlessly tedious, mealy mouthed and most importantly, misleading. It ultimately comes down to the baffling conclusion, as implied by the German reviewer of ‘Forbidden Music’, that there was no Jewish persecution of these composers because they did not see themselves as Jews. This misleads all who try to make sense of the past. And it was these views that for far too long kept Jewish composers out of post-war musical life, if they were not seen to represent a post-1945 restitution of the pre-Hitler avant-garde. It resulted in the exclusion of pre-war progressives such as Berthold Goldschmidt as well as conservatives such as Korngold, Hans Gál or Braunfels. Historic absolution came easier if one eradicated the racist language of the perpetrators. Paradoxically, this could only be achieved by unwittingly continuing their racist policies. It was easier to pick up the pieces where progressive movements had been broken rather than use the terms employed by a discredited and ignorant age. As a result, undeniably great composers such as Bartók, Berg, Webern and Hindemith were offered cultural restitution long before their ‘Jewish’ colleagues such as Korngold, Braunfels, Gál, Goldschmidt, Wellesz, Schreker, Zemlinsky or Weigl. Anti-anti-Semitism, often disparagingly called ‘philo-Semitism’ can be just as proscriptive as its opposite pole. The views of the past as seen from Germany (and Austria) and the countries of refuge thus offer very different interpretations. But it is with a degree of sadness and resignation that I have to accept the fact that even my generation has to die out before memory can truly pass on into history.